At ViCOROB, we do research on Underwater Vision and Robotics. One of the developed technologies in the last years, currently being valorized in the context of SOUNDTILES project (Ref. : 2016 PROD 00130) consists on the development of a tool for automatic processing of sonar mosaics, a breakthrough in the current technologies available commercially. 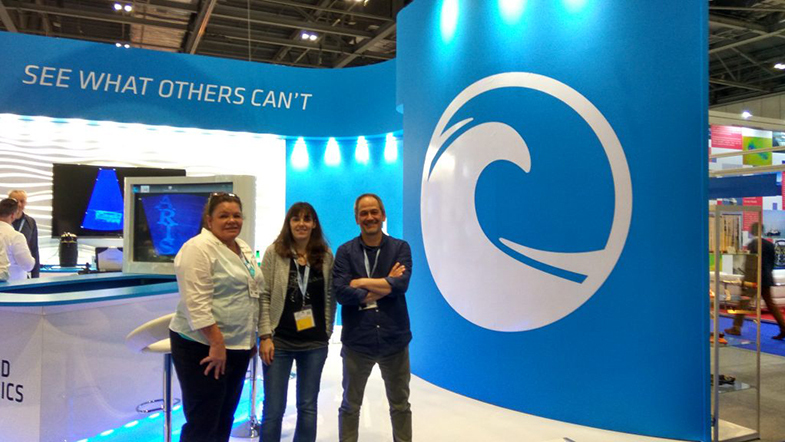 Natàlia Hurtós presented this technology in front of a commercial audience in the most important fair of underwater technologies, Oceanology International, that took place in London (UK). In the same event, ViCOROB team had the chance to meet with industry key actors, like the American company SoundMetrics. These activities have been carried out on the effort that the lab is doing towards bringing this technology to the market in the near future in the framework of SOUNDTILES project.